A common human polymorphism in the gene that encodes brain derived neurotrophic factor (BDNF), Val66Met, is considered a marker of vulnerability for mental health issues and has been associated with cognitive impairment. An alternate framework has been proposed in which “risk alleles” are reinterpreted as “plasticity alleles” that confer vulnerability in adverse environments and positive effects in neutral or positive environments (Belsky et al., 2009). These frameworks produce divergent predictions for tests of learning and cognitive flexibility. Here, we examined multiple aspects of learning and cognitive flexibility in a relatively new BDNF Val66Met mouse model (BDNF Val68Met, Warnault et al., 2016), including multiple choice discrimination and reversal, go/no-go learning and reversal, and appetitive extinction learning. 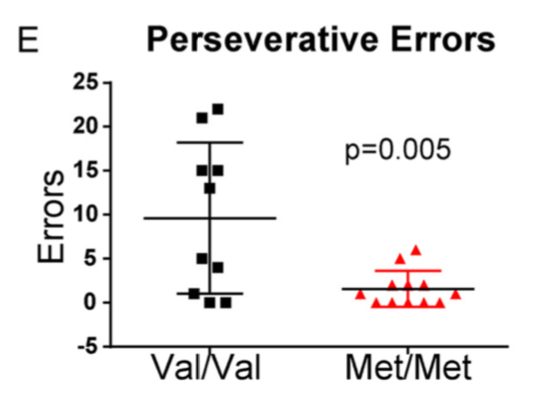 We found that mice homozygous for the Met allele show more efficient reversal learning in two different paradigms, but learn at rates comparable to Val homozygotes on the multiple choice discrimination task, a go/no-go task, and in appetitive extinction. Our results dissociate reversal performance from go/no-go learning and appetitive extinction and support the plasticity allele framework that suggests BDNF Met carriers are potentially more sensitive to changes in the environment. Neuromodulation plays a critical role in brain function in both health and disease. New optical tools, and their validation in biological tissues, are needed that can image neuromodulation with high spatial and temporal resolution, which will add an important new dimension of information to neuroscience research. Here, we demonstrate the use of a catecholamine nanosensor with fluorescent emission in the 1000-1300 nm near-infrared window to measure dopamine transmission in ex vivo brain slices. 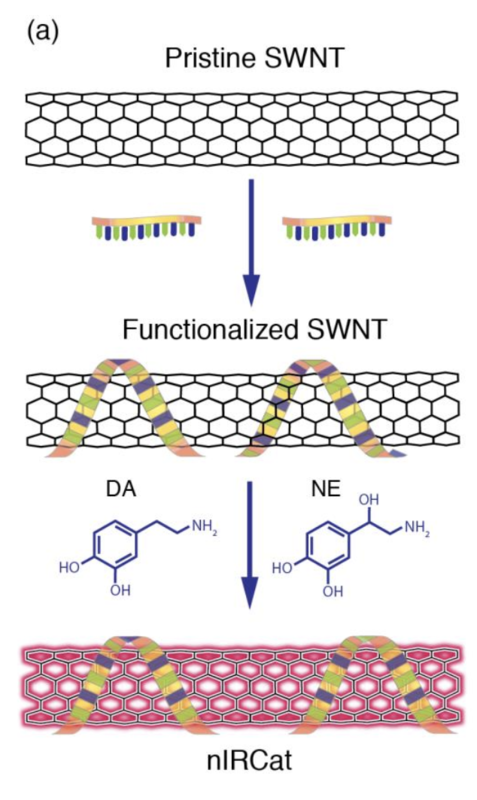 These near-infrared catecholamine nanosensors (nIRCats) represent a broader class of nanosensors that can be synthesized from non-covalent conjugation of single wall carbon nanotubes (SWNT) with single strand oligonucleotides. 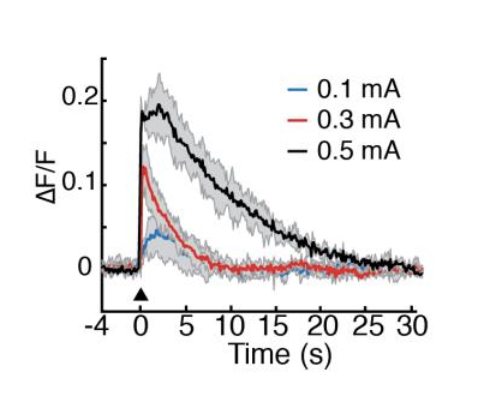 We show that nIRCats can be used to detect catecholamine efflux in brain tissue driven by both electrical stimulation or optogenetic stimulation. Spatial analysis of electrically-evoked signals revealed dynamic regions of interest approximately 2 microns in size in which transients scaled with simulation intensity. Optogenetic stimulation of dopaminergic terminals produced similar transients, whereas optogenetic stimulation of glutamatergic terminals showed no effect on nIRCat signal. Bath application of nomifensine prolonged nIRCat fluorescence signal, consistent with reuptake blockade of dopamine. We further show that the chemically synthetic molecular recognition elements of nIRCats permit measurement of dopamine dynamics in the presence of dopamine receptor agonists and antagonists. These nIRCat nanosensors may be advantageous for future use because i) they do not require virus delivery, gene delivery, or protein expression, ii) their near-infrared fluorescence facilitates imaging in optically scattering brain tissue and is compatible for use in conjunction with other optical neuroscience tool sets, iii) the broad availability of unique near-infrared colors have the potential for simultaneous detection of multiple neurochemical signals, and iv) they are compatible with pharmacology. Together, these data suggest nIRCats and other nanosensors of this class can serve as versatile new optical tools to report dynamics of extracellular neuromodulation in the brain.